Reggies’s board of directors predicted a $6,000 deficit for the 2017-18 year at its annual general meeting on Nov. 20. The Concordia campus bar’s board of directors and roughly 30 of its members gathered to review Reggies’s financial situation and highlight key areas for improvement. 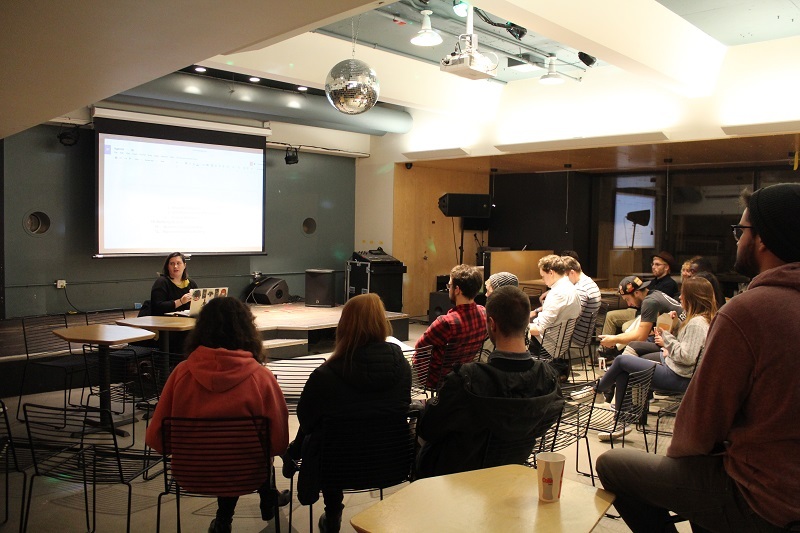 In a presentation of Reggies’s audited financial statements from the year ending on June 30, 2017, outgoing president Rachel Gauthier said the campus bar ended last year with a larger deficit than expected. “Like a lot of restaurants in Montreal, it takes approximately three to five years to actually get on your feet and have a good profit,” Gauthier said. Reggies is entering its third year of operation since re-opening in 2015 following two years of renovations. Reggies is also entering its second year as a solidarity co-op. The bar is non-profit and customers can purchase a $5 membership which grants them part ownership and access to board meetings. “We had to do two things at once: open and then transition into a cooperative,” Gauthier said. To address the bar’s deficit, Gauthier said the board is implementing a number of cost-cutting initiatives which include choosing recipes that use many of the same ingredients to cut down on food waste and limiting the number of staff working at the same time. Gauthier said the board should do more to gain new members and encourage member participation. “The goal is to have as many members as possible because you want people to be involved in the bar, and you want people to want to give their opinions, give their ideas. That’s the point of a cooperative,” she said. According to Gauthier, Reggies has about 500 members. Incoming president Veronika Rydzewski said Reggies is “not very visible on campus,” so a marketing committee will be created to increase the bar’s presence. She said the marketing campaign will include putting up a banner in the Hall building mezzanine and being more active on social media. Rydzewski said Reggies was given an advance of about $34,000 from the CSU over the summer. “This was necessary for us to continue and re-open in September,” she said. McLellan said Reggies is introducing new events, including open-mic and trivia nights. He said Reggies has also entered into partnerships with a number of brands, including Molson and Red Bull, allowing the bar to buy their products at a discounted price.